Keyhole Conversations steps back in time with Richard Walkup, a prolific painter who later turned his talents to writing. His oil paintings range from realism to abstract, from moody environmental subject matter to city scenes painted with color and excitement. In Thunderstorm, he captures the feel of nature’s power. Can you see the wind pushing huge thunderheads, hear the lightning crackle in the ominous cloud formation ? and what his paintings represent to him. “Everything I know about painting I learned in fourth grade art class, from primary colors to vanishing points and horizon lines. Using an abstract subject that obsessed me for weeks, I began painting Puzzle Cubes In Space in 1970. That was followed by Kansas City Turns On, inspired by a picture of Kansas City, Missouri, at dusk from beneath the Pesao Bridge over the Missouri River, as depicted on the 1969 Kansas City, Missouri, phone directory. “Then came, In The Beginning, (Cockroaches Rule), Water and Wine, still life. (Spaceship) Returning Home, Food Fruit and Wine still life, Ghost Town 1970, Thunderstorm Over the Prairie, Oklahoma City Shines, Spook, my pal. Hang-gliding near Manhattan, Kansas, (Port hole) Portal to Space, America the Beautiful, Chess Dream Scape and Out of the Flat Lands. Keyhole Conversations is proud to present the art of award-winning author, Bonnie Tharp. As you view the slides below, consider the feelings her paintings evoke and how her selection of subject matter, use of color and brush strokes, and movement within the composition capture a love of family and an artist steeped in tradition and enduring values. In her writing, Bonnie Tharp evokes strong images with words, layering the scenes in her novel like the layers of paint she applies to her art work. It is easy to understand how this writer won the 2011 coveted Coffin award for her novel, Feisty Family Values. Bonnie has selected a few of her personal pieces to show today, which includes pen and ink sketches and oil paintings. When asked how she was drawn into art, here is what she had to say. “I was drawn to art from a very young age. As a toddler I doodled on any flat surface, or margins of the newspaper, it didn’t matter. My grandmother pasted all my little drawings in a notebook and gave it to me when I was an adult. When I started grade school, I discovered I loved to sing and my voice wasn’t too bad. All through high school I sang in chorus and with our church choir. It was with that choir that we toured Europe singing in churches in Germany, France, Holland, and Austria. Kansas Authors: Closet Painters? Take a peek. Now that the frantic pace of the holidays is over, it’s time to take a deep breath and relax. Keyhole Conversations has taken note of the fact that most of the writers interviewed on our vlog also paint. It’s another form of creative expression that closely ties into writing. A five-week series on authors who express themselves in other creative ways will be featured on our blog. Our first writer, Bonnie Myrick, followed art as a career before she began to write seriously at the age of sixty-two. Her fiction covers many genres: horror, paranormal, mystery, and historical. Her chosen art media ranges from three-dimensional works of sculpture and pottery, as well as mixed media, painting, and pen and ink sketches. We hope you enjoy peeking through the keyhole into another facet of Bonnie’s life. Bonnie Myrick tells why she became an artist. “I had two sisters who were talented artists. 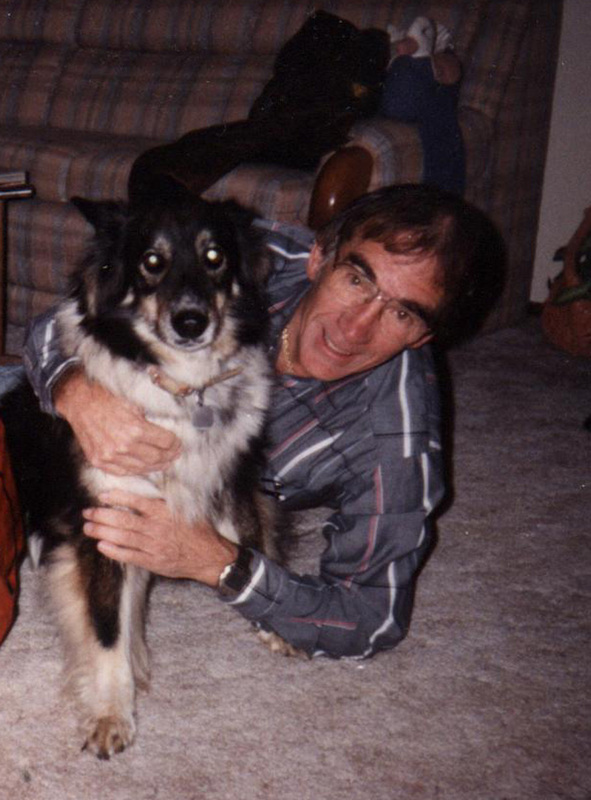 I became an artist by accident when my sister, Betty, wanted me to accompany her to her art classes. I wasn’t interested, but she kept nagging until I agreed. Then I discovered the world of color and began to paint. All I have left are a few of my early personal pieces. A Different Kind of Book Review. It’s always fun to see how characters from the novel respond to our questions. It’s also very interesting to see which character from the book the author allows to be interviewed, which is not always the point-of-view character. It’s one way to see into the heart of the author. Today’s guest is more than a character, he is also a rather unruly character you won’t meet every day. He’s R. C. Bellicki, a professional hacker dealing with computers, lost loves, cops, and good beer. He’s got a heart of gold, is extremely likeable, and is one guy you will enjoy listening to as he reveals issues from his life and what he thinks of H. B. Berlow, the author who created him. You can buy the book at amazon. Take a look at the video below. Read the teaser below for a quick review of the story. He’s a gray-bearded old hippie who wears Hawaiian shirts and makes his living doing subversive internet research. In essence, he’s a professional hacker. But now R.C. 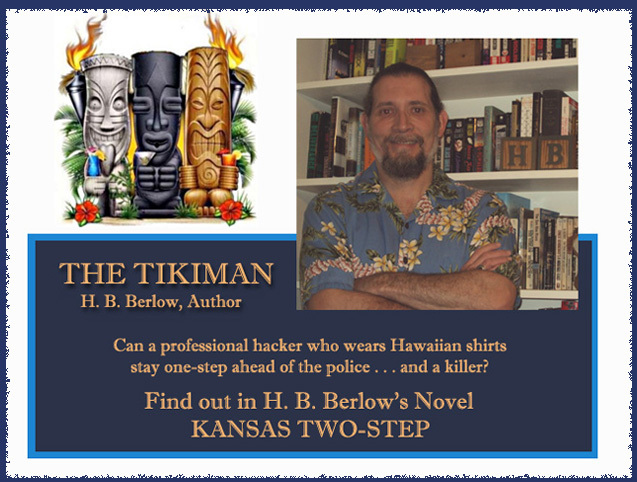 Bellicki has gotten himself caught up in murder, and he has to use all his computer skills to stay one step ahead of the police — and the actual killer. A mystery about computers, lost loves, cops, and good beer. H.B. Berlow (1962- ) studied film-making at the University of Miami and for a time focused his attention on screenwriting. From 1990-1995 his efforts turned to poetry and he was involved in the Boston Slam Poetry scene, despite doing mostly sonnets and traditional poetry. He moved to Wichita, KS when he met his future wife Shelia. 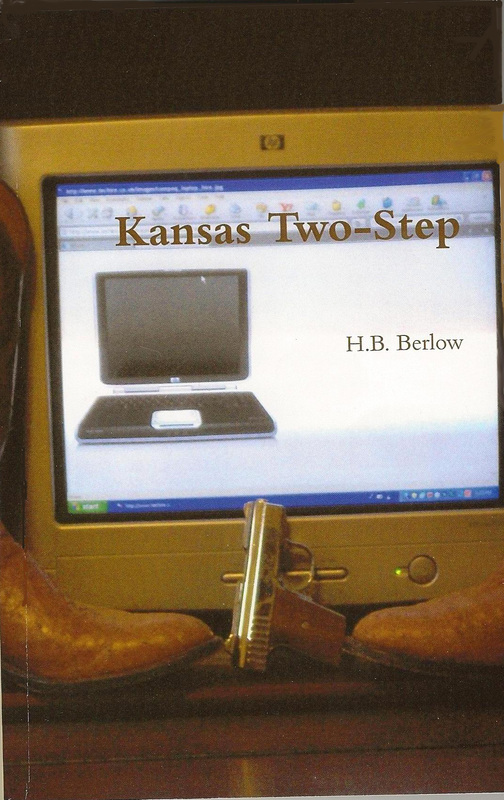 A member of the KWA (Kansas Writer’s Association) since 2007, he has concentrated largely on fiction, focusing on crime (hard-boiled and neo-noir) and transgressive fiction, having been inspired by such writers as James Ellroy, Jim Thompson, Dashiell Hammett, Raymond Chandler, and Chuck Palahniuk. He also paints and creates mixed media art works. He lives in a 100+ year old Victorian house in Wichita with his wife, Shelia, and three cats — Mongo, Camille, & Rupert. You can find his books on amazon.com. Visit his blog. A thank you to Tropical Plants, Flowers, and Decor for the use of their clip art.